Pre-war cars lead the 2017 Gooding Scottsdale auction: a Bugatti Type 35 Grand Prix, an Alfa Romeo 6C Sports Cabriolet and a Bentley 4 ½ Litre Open Tourer. 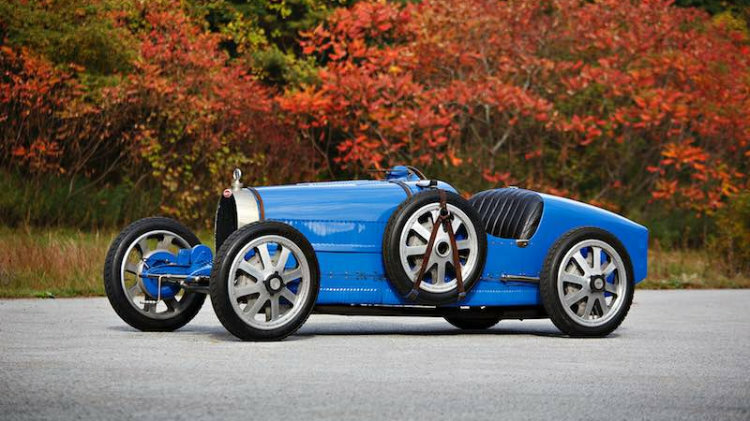 The 1925 Bugatti Type 35 Grand Prix (estimate: $2,600,000-$3,200,000) is in French racing blue and had only three previous owners. The 1932 Alfa Romeo 6C 1750 Series V Grand Sport Cabriolet (estimate: $2,250,000-$2,750,000) has a body by Figoni and Pierre Louis-Dreyfus was possibly the original owner. The 1928 Bentley 4 ½ Litre Open Tourer (estimate: $1,100,000-$1,400,000) is a matching numbers example. A wide variety of cars are usually on offer at the Scottsdale auctions that traditionally mark the start of the classic car auction calendar year. Leading early consignments for the Gooding 2017 Scottsdale sale include magnificent pre-war classics. “Cars of this caliber and from this time period just have a visceral presence about them, which is why modern manufacturers continue to pull design elements from this wonderful chapter in automotive history,” states David Gooding, President of Gooding & Company. The 1925 Bugatti Type 35 Grand Prix (estimate: $2,600,000-$3,200,000), chassis 4487, was sold new in Paris to American Standard Oil heir, Wallis C. Bird. Mr. Bird garaged the car at his famed “Farnsworth” mansion in Long Island, New York, which he had recently purchased. He raced the Type 35 on several occasions in ARCA events on the East Coast (Mr. Bird’s ARCA racing plaque is still affixed to the dash) before passing away in 1941 in an aviation accident. The Bugatti sat among his stable of exotic automobiles until 1961, when his wife, Marjorie Winifred Bird, passed away. Following her death, the Bird estate held the “Car Auction of the Century” where 4487 was purchased by pioneering collector, Henry Austin Clark. The current owner purchased the car from Clark over 35 years ago and has been in his loving care ever since. With just three owners from new and in exemplary condition, 4487 represents the purest expression of the original Bugatti Type 35 Grand Prix. Finished in French Racing Blue, it is a sensational example retaining its original chassis, bodywork, engine, and distinctive early-production features. A 1937 Bugatti Type 57S Cabriolet by Vanvooren, estimate: in excess of $8.5 million, will be on offer in March 2017 at the RM Sotheby’s Amelia Island 2017 sale. The striking Alfa Romeo (estimate: $2,250,000-$2,750,000), chassis 10814377, is a 6C 1750 Series V “Grand Sport” with lovely Figoni Cabriolet coachwork. Born in Italy, Giuseppe Figoni established a successful coachbuilding firm in the suburbs of Paris that become synonymous with quality, innovation, and style. Figoni bodied some of the finest sporting cars of the 1930s, including several Alfa Romeos that were sold new through the firm’s French distributor. Records indicate the first owner of this 1932 Alfa Romeo 6C 1750 Series V Grand Sport Cabriolet might have been Pierre Louis-Dreyfus, of the famed Louis-Dreyfus commodity trading company. A genuine example of a sporting Alfa Romeo, and the only Figoni-bodied Grand Sport Cabriolet known to survive, this car retains its original French chassis and radiator badging that separate it from its Italian brethren. Recently restored by highly regarded specialists and presented today in its original white and black livery, this elegant Alfa Romeo has yet to be debuted at major concours d’elegance. The 1928 Bentley 4 ½ Litre Open Tourer (Estimate: $1,100,000-$1,400,000), chassis FT3221, retains its original chassis, engine, and elegant open Vanden Plas bodywork that has been beautifully restored in British Racing Green. This superb example is offered today with an extensive history file from new and is an ideal entry for touring and vintage rallies. By 1926, Bentley saw a need for a new four-cylinder model. The result was a lightweight 3 Litre chassis with the added power of a larger 4 ½ Litre motor. With the new 4 ½ Litre, the Bentley Boys quickly amassed Le Mans and Grand Prix victories and the public took notice. Many enthusiasts flocked to the dealerships to purchase the sporting new Bentley model with handsome coachwork by Vanden Plas. These Bentley enthusiasts campaigned the 4 ½ Litre cars privately throughout Europe and they quickly gained a reputation as the best handling Bentley in the model range. 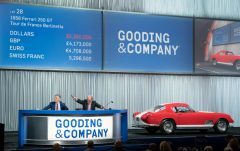 Gooding has also announced several very desirable sports cars for Scottsdale including a 1967 Ferrari 275 GTB/4 and a 1955 Mercedes Benz 300 SL Gullwing.